A rather minimalistic concept user interface for Android, called Sentio, is in the works, but it might be a few months before we see the first beta version. Still, we thought we would share the project with you, and probe what you think of it. Sentio UI is quite the unobtrusive interface, and is a far cry from the current Android skinning efforts, as exemplified by Samsung's TouchWiz, or HTC Sense. It looks much less cluttered, and way more elegant than what we have now, and we'd dare to say it reminds of the Metro UI concept, that is behind the Windows Phone 7 interface. It is being developed by Ethan, mostly known as REALigion from the DarkEdge UI themes on the original Motorola DROID, and the guy wants some feedback how potential users feel about Sentio UI, before they snowplough ahead. The project will be available for stock phones too, not only for rooted devices, so we might see it being officially on Android Market at some point this year. Ultimately Sentio UI can also be had for tablets, and the authors plan "several wonderful features". Pricing of the new user interface for Android will most likely be tiered, with a limited free version available in a try-before-you-buy manner. So does anyone like what they're seeing so far? Sentio UI for Android! from sentio on Vimeo. 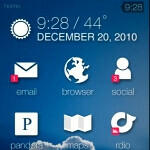 Nokia should buy this company and use this UI on their phones. It looks kinda like Zune Interface. If I wanted a Windows 7 phone, I would buy one.